The inspiration for Isobel's work is a combination of different facets including: architecture, space, memory and emotion. She has always been inspired by architecture and its multi-dimensional portrayal of form. We recently collected Isobel's work from Ceramic Art London and have installed them into the smaller contemporary room. 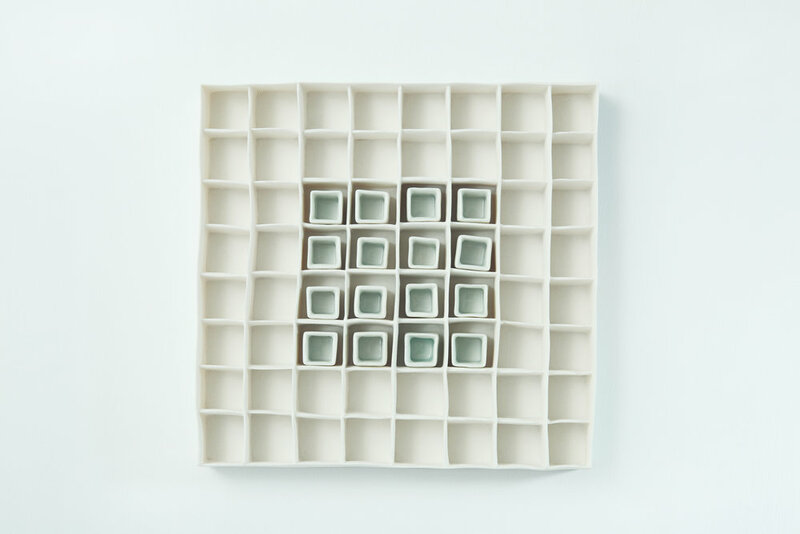 She works with porcelain as the intrinsic characteristics of the material, its translucence and delicate paper-like quality enable the realisation of her concepts. Her work represents a relationship with space and how it shapes us, both physically and emotionally. It investigates the interrelationships between us and the buildings we inhabit. The structures she makes connect these ideas and in doing so reflect on the human condition. She aims to pique the curiosity of the viewer and invite them to explore initially hidden aspects of the work and engage with it by observing it from different perspectives to discover the spaces within. The fundamental basis of Isobel's work is drawn from her life journey, encompassing my personal interactions, experiences and observations.